This is a growing list of fine food, wine and gift shops that carry our truffle Cubze. Depending on the shop, you will find our truffle Cubze for sale by the piece, in gift collections or both. 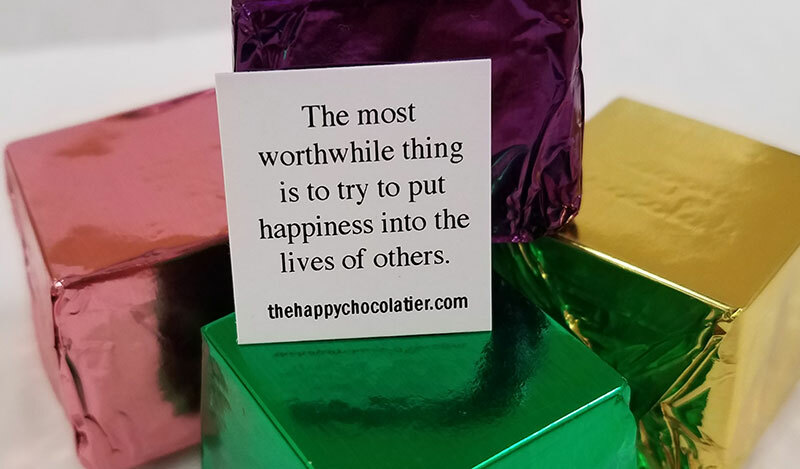 If you would like to see the truffle Cubze at a shop near you, please email your suggestion to us at info@thehappychocolatier.com. You made me very happy! I enjoy reading all the small verses inside the Cubze, and all the flavors are delicious! Thank you so much for the Cubze samplers. My plan was to eat just one per day, but so far I’ve had a real hard time staying on plan. So delicious! The presentation of his chocolate is absolutely beautiful. And they are like little pieces of heaven! While eating this chocolate I dare you to not smile. It’s impossible!